Education in Faith is a life time endeavour, since throughout life, response to God’s call is a function of one’s ‘readiness’. This ‘readiness’ includes age and maturity, family situation, cultural and ethnic backgrounds, career and educational variables, personal experiences and circumstances. 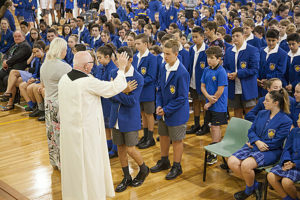 It is in this context that the school plays a role in supporting the faith development of its members – students, staff and parents with particular focus on students in three ways. The second area is the prayer, sacramental and liturgical life of the school. While the knowledge about these is taught in the formal religious education classroom, the celebrating of them is a call and response in faith. Whole school masses, House and level masses, Friday Morning Mass, class masses, classroom room prayer and scripture meditations are such activities at Emmaus that reflect vibrant worship and foster the immersion into the life of a faith community. The third area is concerned with living within the Catholic tradition, orientating life’s decisions and way of living on the values and principles of the tradition. Life is expressed, understood and lived from the matrix of Catholic faith. Retreats, reflection days, seminars , social justice and outreach activities are ways which allow students to reflect, orientate and take action in living the values and principles of the faith tradition.